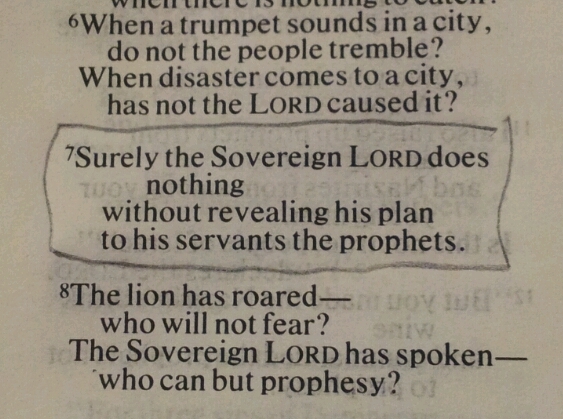 This comes at the end of a long list of Israel’s sins and their neighbours’ sins against them, along with God’s warnings of what he’s going to do to each nation in punishment. So why does he tell his prophets before he carries out these punishments? First, because he’s gracious and compassionate – he wants to give us one last chance to repent and change our ways, like Nineveh did in response to Jonah’s warning. Second, because he wants to be sure that he gets the credit – not in the sense that he is greedy for attention, but because he wants to make sure neither Israel nor her neighbours can say ‘Oh, that was just a natural disaster’ or ‘wow, those enemy armies have really been training hard’. He wants to make a clear link between actions and their consequences so that hopefully, eventually, we’ll learn and change our ways. Can you think of any more reasons? Despite his wife’s warning, Pilate took the path of least resistance – not releasing Jesus, but having him flogged, handing him over to the murderous mob, yet still trying to claim his conscience was as clean as his hands. The Bible notes I’m reading at the moment end their section on this passage with a prayer that God would “help us to face up to the challenges that we encounter and to work them through to the glory of [his] name.” Yet Pilate didn’t face up to the challenges, and didn’t work them through, but God’s name was actually more glorified through Pilate’s weakness and failure. 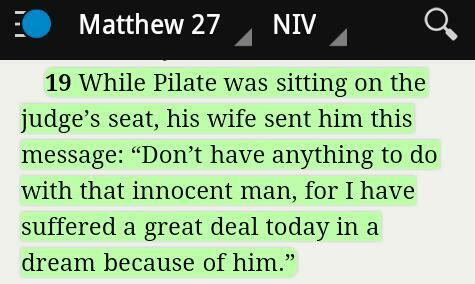 Why did God send a warning through Pilate’s wife if the salvation of the world rested on him not heeding it?